It is almost that time of year again, where everyone has to put together their tax information. What a lot of people do not think about, however, is all of the tax scams that are out there. Every year, more tax scams are reported to the IRS. The government does what it can to shutdown these scams, but your best protection is simply being informed. Here are some common tax scams you need to be on the lookout for during tax time. The biggest growing tax scam is known as phishing sites. These are websites that are designed to look like federal government websites but are really run by scammers. With more and more people filing their taxes online, this has become an even bigger problem in the past few years. If you come across a suspicious looking website, you should report it to the IRS. Once you enter your information on these fake websites, you are likely going to be the victim of identify theft. One scam that has been around for a long time is fake tax preparers. These are people who pretend to work for a tax preparation company but are really just trying to get their hands on your information. Most of the time, fake preparers use fraudulent forms and do not have an actual office location. Much like fake tax preparers, there are also return scammers. These are people who file your taxes for you but demand a huge portion of your refund. Most of the time, they do this by getting you to sign an agreement that you do not actually read first. To avoid this, also be careful when hiring someone to do your taxes for you. Always make sure that you get the preparer’s tax identification number. 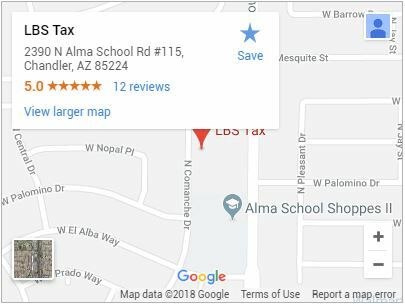 Get ahead of the game and contact LBS Tax in Chandler. We are the most reliable tax preparation company in Chandler Arizona. Give us a call at (480) 664-1249 and see what we can do for you.